No one visits the Spencer Doll and Toy Museum without hearing the story of Amy Morris. 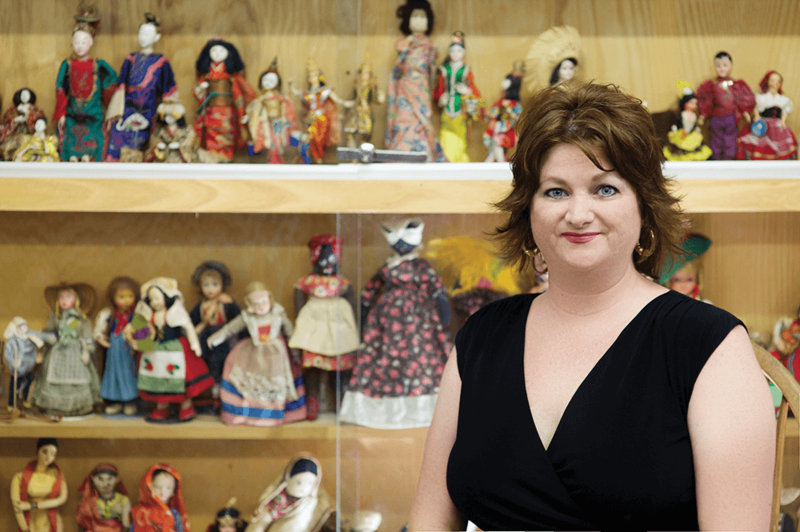 It was Amy’s memory, after all, that inspired the creation of the two-and-a-half-year-old museum, and it was Amy’s collection of some 300 dolls that became its cornerstone. Amy’s dolls, which include dozens of fully accessorized Barbies, occupy several hallowed display cases in the museum. In a sense, the dolls serve as guardians of the past, ensuring those sweet, innocent childhoods of yesteryear won’t be forgotten. Amy lived a short life in her native Rowan County — she died in 1996 at age 21 — and she spent most of those years in a wheelchair. She was born with Werdnig-Hoffmann disease, a genetic disorder that caused her body’s muscles to atrophy. During those 21 years, though, the world was Amy’s toy chest. She packed a lot of living into a short window of time, and one of her greatest passions was collecting dolls. Amy especially loved Barbies, and in particular her Bob Mackie Barbies, dressed glamorously by Mackie, the renowned costume designer for “The Carol Burnett Show” and Cher. The two women joined a local doll collectors’ organization — the Rowan Doll Society of North Carolina — to learn more about the dolls, their value, how to preserve them, and what they might be able to do with them. That ultimately led to the museum’s opening in 2012, and the attraction has thrived. Nance says her sister would be humbled, but thrilled, to see what her doll collection has become. And yet, as I stand before this army of Barbies, I find that my 51-year-old “every-guy” psyche can’t relate. I never played with Barbies — in fact, I’m sure I shunned Barbies, and all other dolls, as if they had cooties. I didn’t even have a sister who might’ve played with Barbies, which would have given Amy’s dolls at least a modicum of relevance for me. What, I’m wondering, does this place have for me? For every adult, there’s at least one toy that will always have the power to transport you back to your childhood, conjuring up memories of those days when playtime seemed endless. For Amy Morris, it was her dolls, which became her constant friends and helped her forget she had a disability. For me? Well, for me, it’s G.I. Joe — and I’ve just spotted him at the Spencer Doll and Toy Museum. You have to understand. When G.I. Joe was introduced in 1964 as “America’s moveable fighting man,” he captured the imagination of a generation of young boys who fancied themselves war heroes. Granted, we didn’t really understand anything about war. We didn’t care whether playing war was politically correct or not, nor did we care whether it was predisposing us to a lifetime of violence. All we knew and cared about was that G.I. Joe was the man. Ice skaters cruise magically (OK, magnetically) across a winter-wonderland Christmas scene complete with lit churches and decorated homes. Never mind that we were essentially playing with dolls — complete with accessories like hats, guns, ammo belts, and canteens — just like all the little girls who were accessorizing their Barbies, which had been introduced a few years earlier. To us, G.I. Joes weren’t dolls — they were “action figures” — and one glance at the museum’s G.I. Joe exhibit resurrects my childhood. Suddenly, I’m 6 years old again, immersed in the action of a pretend war being fought on my bedroom floor decades ago. Whatever your signature toy was — a Roy Rogers cap pistol, a Chatty Cathy doll, a Lionel train set — there’s a good chance you’ll find it, or something close to it, at the Spencer Doll and Toy Museum, because that’s a large part of what this place is about. Consider, for example, the museum’s extensive collection of Shirley Temple dolls and memorabilia, believed to be the East Coast’s largest Shirley Temple collection available for public viewing. The dolls range from the 1930s to the present day and belonged at one time to Marietta Forlaw of Greensboro. There’s the rare Schoenhut miniature Humpty-Dumpty Circus, too, which was considered a high-end toy when it was manufactured in the early 1900s. According to Gregg, it took Huntersville collectors Wayne and Helen Thomas — who loaned the circus to the museum — many years to amass all of the pieces for the miniature circus. For those seeking rare collectibles, this is the museum’s biggest don’t-miss exhibit. Whatever your age, the Doll and Toy Museum in Spencer probably has the toy you cherished. Amy’s sister, Beth Morris Nance, knows the stories behind the toys, including the saga of “the sad German rag doll,” owned by a child of Nazi sympathizers. One of Gregg’s favorite toys is a doll she calls “the sad German rag doll,” whose history can be traced to World War II Germany. The story is that when Allied forces reached Germany near the end of the war, many Germans fled their homes with few possessions. Apparently, a German child left this 14-inch-tall cloth doll on the floor of a school attended by children of Nazi sympathizers. A young soldier from Rowan County found the doll, brought it home to Salisbury, and gave it to a doll collector. Eventually, her collection — including the German rag doll — was donated to the museum. Amy’s Barbies. My beloved G.I. Joe. Even the sad German rag doll. Sentimental value is worth nothing, yet is simultaneously priceless. 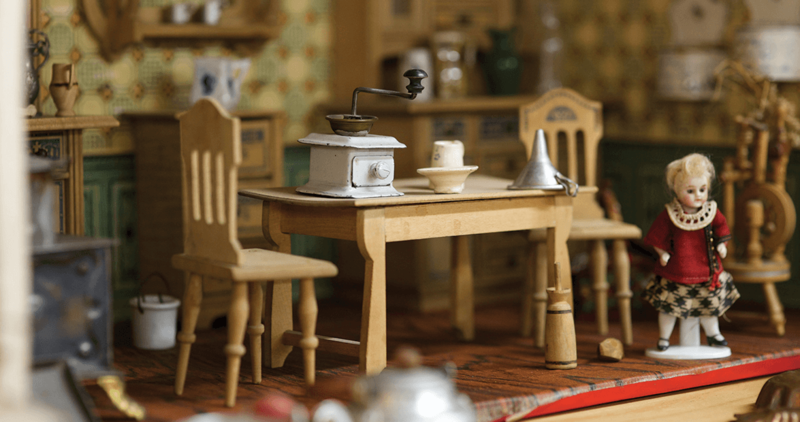 Here at the museum, their expressions, and accessories — and yes, the stories behind them — remind us that while childhood joy may fade, the toys that claim our memories live on.